Last summer I met a woman, Cherie, at an art show in Flint. She invited me to come to her home to take some reference photos for garden paintings. She thought I would be especially interested in an adorable little milk shed she and her husband rescued just in the nick of time from demolition. 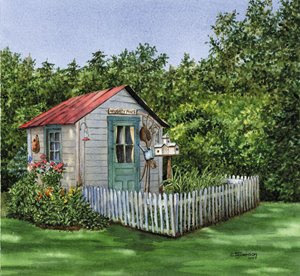 I really loved the shed and the little garden she had planted around it. Her shed was decorated with antique garden tools and a little sign that read, "Naughty Pines". Here is the finished painting. I tried to capture the feel of the sunlight as it trickled through the high tree branches. The shed was mostly in shade during the time of day that I took the photos, but a tiny bit of sun was peeking through. She also gave me a tour of her historical neighborhood. What a treat for me! I hope to see Cherie again soon and take her up on her promise to show me more charming spots around her hometown.